Police Officer Francis Quinlan suffered a fatal heart attack following a pursuit in the area of 13th Street and Lehigh Avenue. He was sleeping at the police station, at the intersection of Park Avenue and Lee Avenue, when he was awakened at approximately 12:30 am and notified of a disturbance one half block away. He ran to the scene, and then chased one subject who fled on foot. He was able to arrest the man near Cambria Street and returned him to the police station where he placed him in a cell and then returned to the bunkroom to go back to sleep. He failed to report to rollcall at 6:30 am and was it was discovered he had passed away in his sleep. 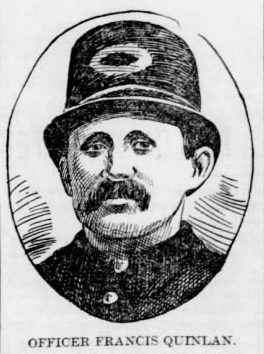 Officer Quinlan had served with the Philadelphia Police Department for eight years. He was survived by his wife and five children. 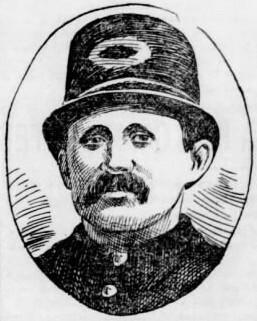 On today, the 120th anniversary of your death I would just like to say thank you for your service and sacrifice for the citizens of Philadelphia.